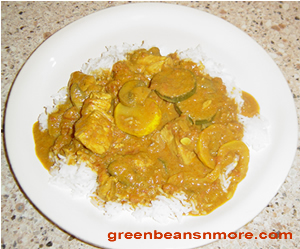 This is a very special Indian chicken recipe. It was given to me by Michael Clark, my husband's uncle in England. It's a recipe he has been cooking for over 40 years. He learned it from a friend when he was a young man in the military serving his country. He made this very special chicken curry for us during a visit to England and it was absolutely delicious. He served it with a side of rice, zucchini/mushrooms and chutney. I was amazed at the full bodied and rich sauce. The sauce contains coconut milk and a ratatouille blend of vegetables (tomato, zucchini, onion). Dice onion and put into Dutch oven with a olive oil, cook til translucent. Add more oil if necessary. Put chicken in pan and cook until lightly cooked on both sides. Add curry paste, fish sauce, garam masala and turmeric. Gently stir. Add ratatouille vegetables or fresh vegetables. Cover pot, let curry simmer for 10-15 minutes (or until fresh vegetables soften). Stir from time to time. Taste for flavor, add more spices if needed. Just before curry has finished cooking sprinkle sliced jalapeno on top. Serve with rice, chutney, pickled limes, puppodums or naan. Cook's Tips: If you are using fresh vegetables you may need to add more coconut milk. As I was unable to find a canned ratatouille blend here in my area, I added fresh mushrooms, fresh zucchini and drained canned diced tomatoes. As the vegetables cooked down they helped to thicken the sauce. Uncle Mike suggested using curry paste as it blends much smoother than curry powder.